Currently viewing the tag: "Joint Force"
This is the guiding document for the U.S. Department of Defense that shifts the nation’s military toward the Asia-Pacific region. Given that we cannot predict how the strategic environment will evolve with absolute certainty, we will maintain a broad portfolio of military capabilities that, in the aggregate, offer versatility across the range of missions described above. We have sought to differentiate between those investments that should be made today and those that can be deferred. We are determined to maintain a ready and capable force, even as we reduce our overall capacity. We will resist the temptation to sacrifice readiness in order to retain force structure, and will in fact rebuild readiness in areas that, by necessity, were deemphasized over the past decade. It will be necessary to examine how this strategy will influence existing campaign and contingency plans so that more limited resources may be better tuned to their requirements. The Department will need to examine the mix of Active Component (AC) and Reserve Component (RC) elements best suited to the strategy. As we transition out of Iraq and draw down in Afghanistan, we will take extra measures to retain and build on key advancements in networked warfare in which joint forces have finally become truly interdependent. In adjusting our strategy and attendant force size, the Department will make every effort to maintain an adequate industrial base and our investment in science and technology. The balance between available resources and our security needs has never been more delicate. 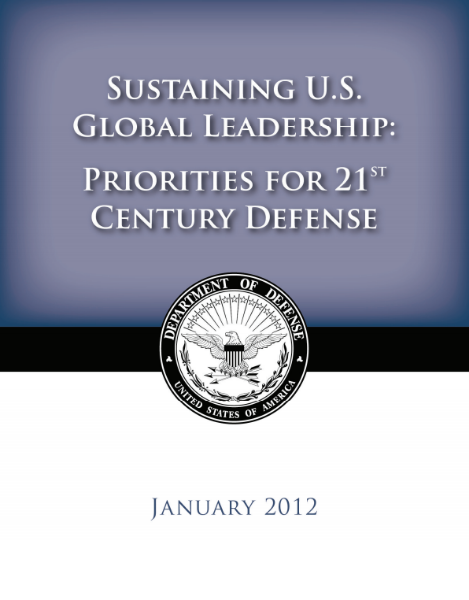 Force and program decisions made by the Department of Defense will be made in accordance with the strategic approach described in this document, which is designed to ensure our Armed Forces can meet the demands of the U.S. National Security Strategy at acceptable risk. Right off the bat if you can’t tell that the Defense Information Systems Agency, or DISA, is going mobile you should probably be in another line of work (there are 11 Apple iPads pictured on the cover page). Global Defense Posture – While maintaining DISA’s focus on the current fight in Afghanistan and their ongoing engagement efforts in Europe and Africa, they will adjust their operations to accommodate the Department’s shifts in global defensive posture towards the Asia-Pacific region. DISA will lead the development and operation of a layered, fault-tolerant enterprise information environment consisting of rapidly deployable components that allow for contingency operations in a full range of conflict. Cyber Command and Control (C2) – DISA will posture the Agency in concert with U.S. Cyber Command to expand Defensive Cyber Operations (DCO) and DoD Global Information Grid Operations (DGO) mission support through evolving and innovative initiatives. Nuclear Command, Control, and Communications (NC3) – DISA will focus attention on developing and enhancing enterprise solutions in support of national leadership and nuclear command and control. Joint Information Environment (JIE) – DISA will be the lead for the JIE Technical Synchronization Office (JTSO). They will enable a consolidated, collaborative, and secure JIE enabling end-to-end information sharing and interdependent enterprise services across the Department. DoD Cloud Services – DISA will enable rapid provisioning of services for the Department as the DoD Cloud Services Broker, and they will converge components of the enterprise for a more efficient and affordable architecture through consolidation of data centers, NetOps centers, and migration to cloud computing. Mobility – DISA will promote rapid delivery, scaling, and utilization of secure mobile capability leveraging commercial mobile technology to enable an agile deployment environment for new and innovative applications to support evolving Warfighter requirements. Acquisition Agility – DISA will employ an acquisition strategy that reduces procurement cycle times and accelerates delivery of critical capabilities. Incremental development, preplanned product improvement, and agile development will be key in our acquisition strategy. DISA’s Vision: Information superiority in defense of our Nation. DISA’s Mission: DISA, a Combat Support Agency, provides, operates, and assures command and control, information sharing capabilities, and a globally accessible enterprise information infrastructure in direct support to joint Warfighters, National level leaders, and other mission and coalition partners across the full spectrum of operations. Evolve the Joint Information Environment. 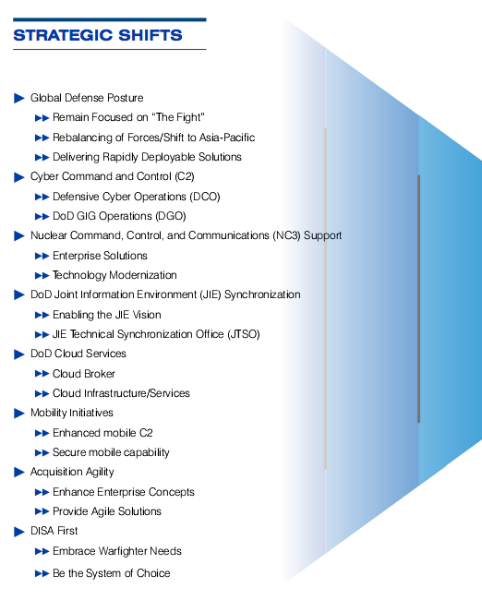 Evolve a consolidated, collaborative, and secure joint information environment, enabling end to end information sharing and interdependent enterprise services across the Department that are seamless, interoperable, efficient, and responsive to joint and coalition Warfighter requirements. Provide Joint Command and Control (JC2) and Leadership Support. Engineer, provide, and enhance command and control (C2) and mission partner information sharing capabilities to enable decision makers with the ability to exercise authority and direction over assigned and attached forces and resources while rapidly and effectively sharing information across the strategic, operational, and tactical spectrum of operations. DISA will lead the development and evolution of JC2 capabilities used to plan and execute the full range of joint, interagency, and multinational military operations. Operate and Assure the Enterprise. Provide adaptive and innovative cyber/network command and control (C2) to enable responsive operations and defense of a joint and coalition enterprise information environment in a contested or degraded cyber battlespace ensuring information superiority in defense of our Nation across the full spectrum of military operations. 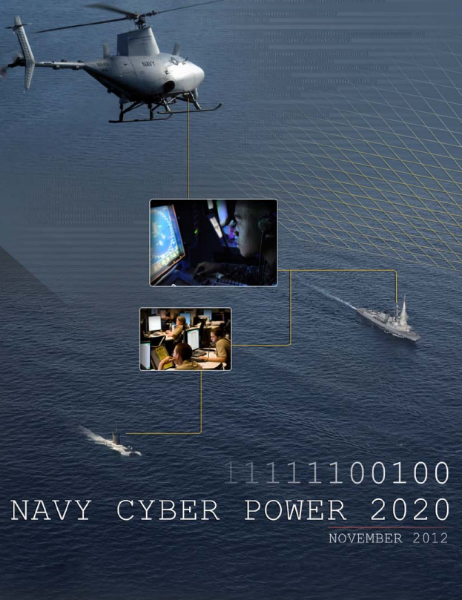 Evolve our cyber and network operations capabilities to function under dynamic conditions responding to increasing Warfighter information requirements, increased demand for operational efficiencies, and shifts in the global defense posture. DISA must actualize a resilient and responsive operational structure with advanced technology, synchronized processes and procedures, and a highly-trained workforce that is prepared to consistently and rapidly adapt to changing circumstances and respond to crisis and contingency requirements around the world, on demand. Optimize Department Investments. Enable the Department to maximize use of its resources by providing cost efficient capabilities; an effective and defensible infrastructure; and standardized support services, business processes, and policies that enable the rapid infusion of technology into the enterprise.